There seems to be a general consensus on the reality of increasing income inequality in the U.S. and even some agreement on its two main causes: globalization and the rapid spread of technology. The slow growth of the economy since the end of the recession has made the inequality problem that much worse. 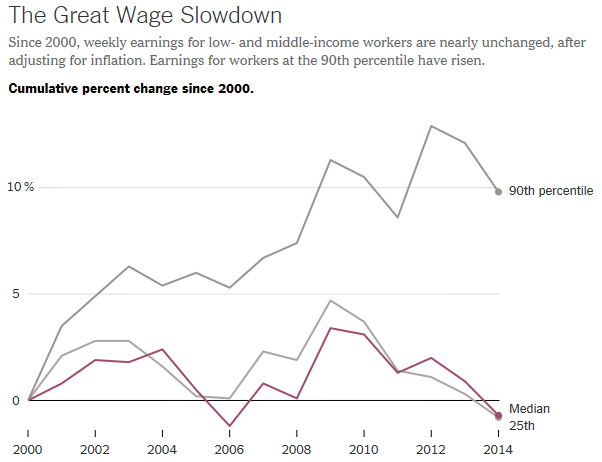 Not surprisingly, slow economic growth in the past five years has led to stagnant wages for many workers. My last post addressed this problem. The above chart from the New York Times shows that incomes for top wage earners have been rising in recent years while they have been stagnant for middle- and lower-income workers. But there is more to it than this. In yesterday’s Wall Street Journal, Mark Warshawsky and Andrew Biggs point out that, “Income Inequality and Rising Health-Care Costs,” in the years 1999 – 2006, total pay and benefits for low income workers rose by 41% while wages rose by only 28%, barely outpacing inflation. For workers making $250,000 or more total compensation rose by a lesser 36% while wages grew by a greater 35%. This apparent anomaly is explained by the fact that health insurance costs are relatively flat across all income categories, thus comprising a much larger percentage of the total pay package of low-income workers than for high-income workers. 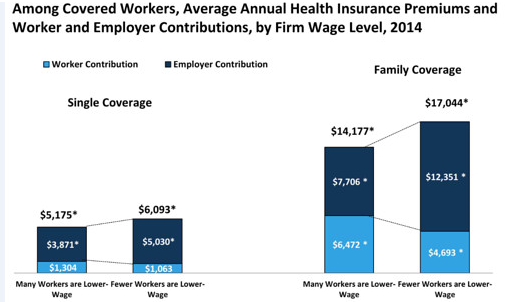 In fact, the Kaiser Foundation has shown that low-wage workers tend to pay higher health insurance premiums, as well as receiving lower insurance benefits, than higher paid workers (see the above chart). Overall, what this means is that employer provided healthcare is taking a huge chunk out of the earnings of low-income workers which makes income inequality much worse than it would be otherwise. Of course, the cost of healthcare is a huge burden for the entire U.S. economy, currently eating up 17.3% of GDP, twice as much as for any other developed country. For both of these reasons it is an urgent matter for the U.S. to get healthcare costs under control. Avik Roy of the Manhattan Institute has an excellent plan to do just this as I have discussed in several recent posts. This entry was posted in Andrew Biggs, health care, health insurance, income inequality, Jack Heidel, Kaiser Foundation, Mark Warshawsky, New York Times, stagnant economy, wage stagnation, Wall Street Journal and tagged economic growth, Economic inequality, health care, health care inflation, income inequality, jack heidel, New York Times, stagnant economy, stagnant wages, Wall Street Journal by jackheidel. Bookmark the permalink.